Parliament’s Standing Committee on Finance adopted the Health Promotion Levy (HPL) also known as the sugar tax. The levy stems from the National Department of Health’s (DoH) Non-Communicable Diseases (NCDs) Strategy which identifies sugar, salt, alcohol and tobacco as risk factors that cause NCDs. The Strategy recommends various actions to reduce the burden of disease caused by NCDs. NCDs are health conditions or diseases which are “non-infectious” and likely to be caused by the risk factors. The sugar tax is also set against the global backdrop of the increasing incidence of obesity stemming from the overconsumption of sugar. Obesity is a global epidemic and a major risk factor linked to the growing burden of NCDs. The NCDs Strategy identified taxes on foods high in sugar as a very cost-effective strategy to address diet-related disease. The sugar tax was first mentioned in the Minister of Finance’s policy statement/ announcement (Budget Speech) in February 2016, National Treasury (NT) published the Policy Paper on Taxation of Sugar Sweetened Beverages in July 2016 inviting comments from the public. The sugar tax was then set to be implemented in April 2017 at a rate of 20% on the sugar in the beverage. The Rates and Monetary Amounts and Amendment Revenue Bill was tabled in Parliament earlier this year and referred to the Standing Committee on Finance. The Committee held extensive public hearings and raised concerns about the negative impact on the economy, employment and emerging farmers. This is a particularly sensitive issue given that the National Development Plan (NDP) aims to eliminate poverty and inequality by 2030. Growing the economy and creating employment plays a crucial role in the policy achieving its objectives. At the same time the DoH needs to prolong life, ensure that we live healthy lives and reduce the cost NCDs imposes the state. The committee had to mediate between the competing interest of health versus trade. A good example of “meaningful” consultation with public. A parallel consultation and engagement process was held at the National Economic Development and Labour Council (Nedlac). This was the first occasion that the stakeholders engaged on a tax bill at Nedlac. The process was largely driven by Cosatu as it was particularly concerned about the loss of jobs and the lack of mitigating plan to the loss of jobs. 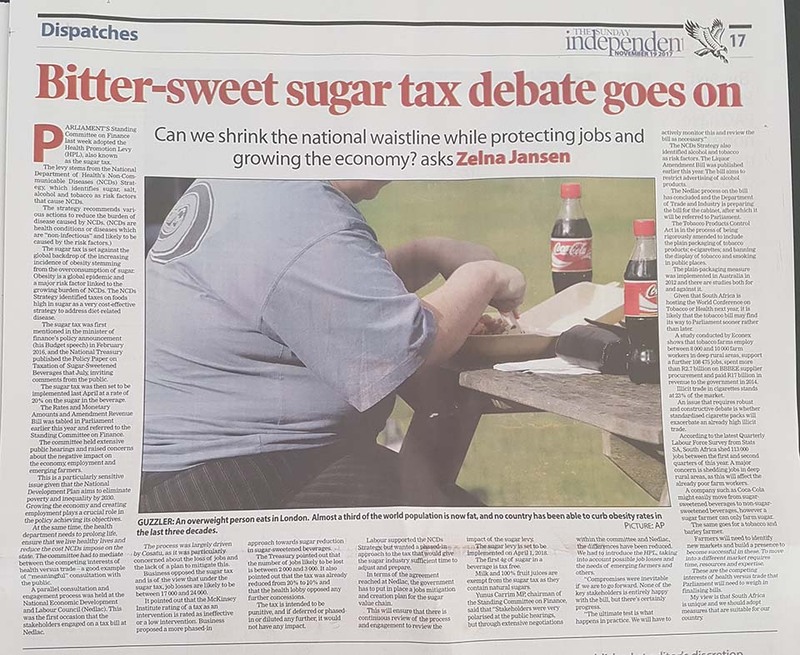 Business opposed the sugar tax and is of the view that under the sugar tax job losses are likely to be between 17 000 and 24 000. It pointed out that the McKinsey Institute rating of a tax as an intervention is rated as ineffective or a low intervention. Business proposed a more phased-in approach towards sugar reduction in sugar sweetened beverages. NT pointed out that jobs likely to be lost is between 2000 and 3000. NT also pointed out that the tax was already reduced from 20% to 10% and that the health lobby opposed any further concessions. The tax is intended to be punitive and if deferred or phased-in or diluted any further, it would not have any impact. Labour supported the NCDs Strategy however wanted a phase in approach to the tax that would give the sugar industry sufficient time to adjust and prepare. In terms of the agreement reached at Nedlac, Government has to put in place a Jobs Mitigation and Creation Plan for the sugar value chain. This will ensure that there is continuous review of the process and engagement to review the impact of the sugar levy. The sugar levy is set to be implemented in 1 April 2018. The first four grams of sugar in a beverage is tax free. Milk and 100% fruit juices are exempt from the sugar as it contains natural sugars. The NCDs Strategy also identified alcohol and tobacco as risk factors. The Liqour Amendment Bill was published earlier this year. The bill aims to restrict advertising of alcohol products. The Nedlac process on the bill has concluded and the Department of Trade and Industry is preparing the bill for Cabinet where after it will be referred to the Parliament. The Tobacco Products Control Act is in the process of being rigorously amended to include the plain packaging of tobacco products; e-cigarettes; banning the display of tobacco and public place smoking. The plain packaging measure was implemented in Australia in 2012 and there are studies for and against it. Given that South Africa is hosting the World Conference on Tobacco or Health in 2018, it is likely that the Tobacco bill may find its way to Parliament sooner rather than later. A study conducted by Econex, shows that tobacco farms employ between 8000 to 10000 farm workers in deep rural areas, supports a further 108 475 jobs, spent over R2,7 billion on BBEEE supplier procurement and R17,2 billion was paid in revenue to Government in 2014. Illicit trade in cigarettes stands at 23% of the market. An issue that requires robust and constructive debate is whether standardised cigarette packs will exacerbate an already high illicit trade. According to the latest Quarterly Labour Force Survey from Stats SA, South Africa shed 113 000 jobs between the first and second quarter of this year. A major concern is shedding jobs in deep rural areas as this will affect the already poor farm workers negatively. A company such as Coca Cola could easily move from sugar sweetened beverages to non-sugar sweetened beverages however a sugar farmer can only farm sugar. The same goes for a tobacco and barley farmer. Farmers will need to identify new markets and build a presence to become successful in a new market. To move into a different market requires time, resources and expertise. These are the competing interest of health versus trade that Parliament will need to weigh in finalising the bills. My view is that South Africa is unique and we should adopt measures that are suitable for our country.